Someone close to me shared a thought they had about how contradictory it is that we are so very dependent physically and emotionally we are as a species and yet we suffer from fear of abandonment.....and how that fear of abandonment is present throughout our lives and in most of our relationships. I thought about it for a while before commenting back on the thought. I think we experience this fear of abandonment because at a very deep level we have felt abandoned by our Creator. I know I have felt this way in the past as if God had sent me down here and just left me to my own luck. I felt lost, alone and confused believing I had to fend for myself. It's a deep feeling of abandonment, and honestly, only God can heal that. Of course, I realize now that God never abandoned me and it's only a perception I have. God always Is. Since I've been more willing to heal my mind and my perception of myself and of this whole world, I feel God's presence in my life and become aware that I am not alone, that God never left me, that I chose at some level to be independent and separate from God (which is impossible)....this hasn't worked out well at all. Just look at the condition of this world. As I do the work of removing the blocks in perception, which are the false beliefs in guilt and sin and punishment, and focus on what is Truth, the fear dissipates. God has never left me nor judges me and there is nothing to fear. 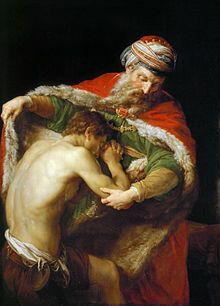 The parable of The Prodigal Son in the Bible in Luke 15:11–32 is an idea of the loving Farther God is. God is Love.